To receive email notifications of all crime watch or general news posts and updates, you must subscribe. After adding your email address you will receive an email response for you to confirm you subscription. You must confirm your subscription in order to complete the registration. Emails will be sent to all subscribers as soon as key news and updates are posted. In order not to clutter anyone’s email inbox, we will strive to post no more than once a week with other news information that is not an alert. The subscription list is completely under our control to maintain your privacy and will not be shared with anyone for any reason. Having Problems Confirming Your Subscription? Click on the link https://subscribe.wordpress.com. Enter your email address and select “Request Details”. You will receive an email with a link to your subscription page that will look similar to the below. Select “Pending”. You can now confirm your subscription by selecting the “Confirm” button. Have you Opted Out of WordPress Subscription Notifications? 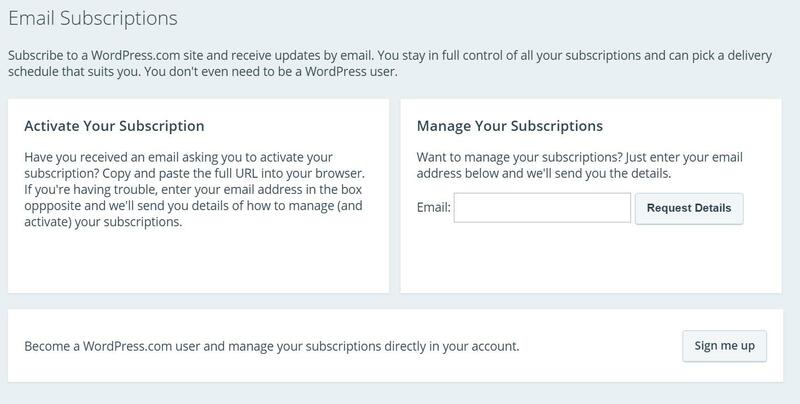 If you have received the message that you were opted out of WordPress subscriptions when trying to subscribe you will need to unblock email updates from WordPress to receive notifications. Select “Settings” from the Subscription Management window. If you have a WordPress account you will be prompted to select the “WordPress.com Reader” link otherwise you can skip to step 4. In your profile page select “Reader Subscriptions”. Scroll to the bottom and deselect the option to block all email updates from blogs you’re following. Click on “Save Changes” or “Save Notifications Settings” whichever may appear for you.